Jamfaced: 5 Childhood Food Memories - Tagged for my first Meme. 5 Childhood Food Memories - Tagged for my first Meme. 1) The smell of birthday candles after they are blown out takes me back to birthday dinners in Italian trattorias as a kid; white jacketed waiters singing happy birthday and me falling asleep in the booth after dessert. 2) I get a hit of the smell of ragu cooking and I'm a kid again stealing sauce from the simmering pot and heaping it on white bread and snaffling it down in my bedroom. 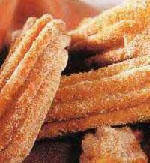 3) Even the sight of Churros and Chocolate and I can relive every summer spent in Spain. 4) Wine and Orange Juice. There was always wine on the table at mealtimes in our house, my first tastes of it were mixed with Orange Juice as a toddler. I'll still sneak some into OJ but only when nobodies looking. 5) Paella is forever the preserve of my dad. There is nothing he likes to cook better and all others are compared to his. If you are tagged, here's what you do: Remove the blog at #1 from the following list and bump every one up one place; add your blog’s name in the #5 spot; link to each of the other blogs for the desired cross-pollination effect. Next: select new friends to tag and add to the pollen count.Then create a post listing your own five food memories. I love the orange juice and wine confession, hilarious. I'll try it sometime when no one is looking! Are you going to tag some new people too - that is the way to start getting your blog out and about in the world! Great answers! I think this is a really interesting meme. (I'm the one who tagged Sam.) Just linked here from a comment you left on my site. Looking forward to reading more of your posts.